Fukagawa Reitaisai (深川例大祭) is one of the Major Edo Festival, as well as Sanno Maturi and Kanda Matsuri. It happens around middle of August. 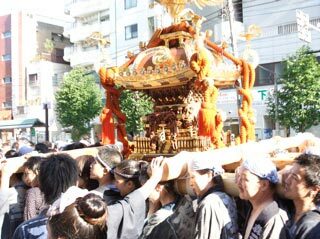 There are over 50 Mikoshi carried. Every three years, the main Miyamikoshi appears on this Festival. This Matsuri starts since the beginning of Edo government about 400 years ago. This is also know as "Mizukake Matsuri, throwing water festival" because people throwing water to the Mikoshi carriers. There is no food stand like other festival. This festival is one of the traditional Matsuri held at Tokyo. Fukagawa Jinmeigu Shrine is the center of the festival and all towns around the shrine will carried their own Mikoshi until Sunset. Some of the Mikoshi including huge Shrine Mikoshi survived through the confusion of WWII and Kanto Earthquake. "Wasshoi" is the traditional call out for the Matsuri, and people are throwing at water to the Mikoshi carriers. Matsuri of Tokyo had began at the beginning of Edo Period to make a strong relationship and friendship at Edo towns because, at this time, many people moved in Edo. So, there were many strangers overflowed in Edo. Matsuri had started to connects those strangers tight in relationship. Today, you can still see how it's important for all people in Fukagawa towns. The real tradition is still carried by real Edo people in this Matsuri.